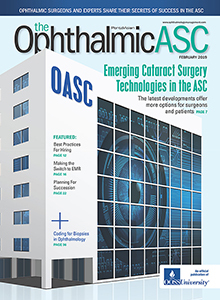 The latest issue of The Ophthalmic ASC has something for everyone, from advice for those considering expansion to the latest information about new technologies and procedures. Jeffrey Whitman, MD, president and chief surgeon at Key-Whitman Eye Center in Dallas shares the dilemmas and decisions his team faced when deciding whether to renovate their existing facility or build a brand-new one. 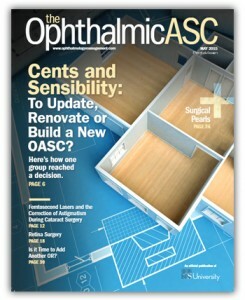 Five experts weigh in with advice for those considering additional operating room capacity. Contributing editor Susan Worley writes about the use of femtosecond lasers to correct astigmatism during cataract surgery, and Richard Hoffman, MD, CPI, and Laurie K. Brown, MBA, COMT, COE consider the use of telescope implants for advanced AMD patients. To read these articles and more, click here.